FNDLOAD <username>/<password> 0 Y DOWNLOAD $FND_TOP/patch/115/import/afcppstl.lct xxaoa_file_name.ldt STYLE PRINTER_STYLE_NAME="printer style name"
FNDLOAD <username>/<password> 0 Y DOWNLOAD $FND_TOP/patch/115/import/aflvmlu.lct xxaoa_file_name.ldt FND_LOOKUP_TYPE APPLICATION_SHORT_NAME="prod" LOOKUP_TYPE="lookup name"
FNDLOAD <username>/<password> 0 Y DOWNLOAD $FND_TOP/patch/115/import/afffload.lct xxaoa_file_name.ldt DESC_FLEX P_LEVEL=:COL_ALL:REF_ALL:CTX_ONE:SEG_ALL? APPLICATION_SHORT_NAME="prod" DESCRIPTIVE_FLEXFIELD_NAME="desc flex name" P_CONTEXT_CODE="context name"
FNDLOAD <username>/<password> O Y DOWNLOAD $FND_TOP/patch/115/import/afffload.lct xxaoa_file_name.ldt DESC_FLEX DESCRIPTIVE_FLEXFIELD_NAME="PER_%"
FNDLOAD <username>/<password> 0 Y DOWNLOAD $FND_TOP/patch/115/import/afffload.lct xxaoa_file_name.ldt KEY_FLEX P_LEVEL=:COL_ALL:FQL_ALL:SQL_ALL:STR_ONE:WFP_ALL:SHA_ALL:CVR_ALL:SEG_ALL? APPLICATION_SHORT_NAME="prod" ID_FLEX_CODE="key flex code" P_STRUCTURE_CODE="structure name"
FNDLOAD <username>/<password> 0 Y DOWNLOAD $FND_TOP/patch/115/import/afcpprog.lct xxaoa_file_name.ldt PROGRAM APPLICATION_SHORT_NAME="prod" CONCURRENT_PROGRAM_NAME="concurrent name"
FNDLOAD <username>/<password> 0 Y DOWNLOAD $FND_TOP/patch/115/import/afffload.lct xxaoa_file_name.ldt VALUE_SET FLEX_VALUE_SET_NAME="value set name"
FNDLOAD <username>/<password> 0 Y DOWNLOAD $FND_TOP/patch/115/import/afffload.lct xxaoa_file_name.ldt VALUE_SET_VALUE FLEX_VALUE_SET_NAME="value set name"
FNDLOAD <username>/<password> 0 Y DOWNLOAD $FND_TOP/patch/115/import/afscprof.lct xxaoa_file_name.ldt PROFILE PROxxaoa_file_name="profile option" APPLICATION_SHORT_NAME="prod"
FNDLOAD <username>/<password> 0 Y DOWNLOAD $FND_TOP/patch/115/import/afcpreqg.lct xxaoa_file_name.ldt REQUEST_GROUP REQUEST_GROUP_NAME="request group"APPLICATION_SHORT_NAME="prod"
FNDLOAD <username>/<password> 0 Y DOWNLOAD $FND_TOP/patch/115/import/afscursp.lct xxaoa_file_name.ldt FND_RESPONSIBILITY RESP_KEY="responsibility"
3. 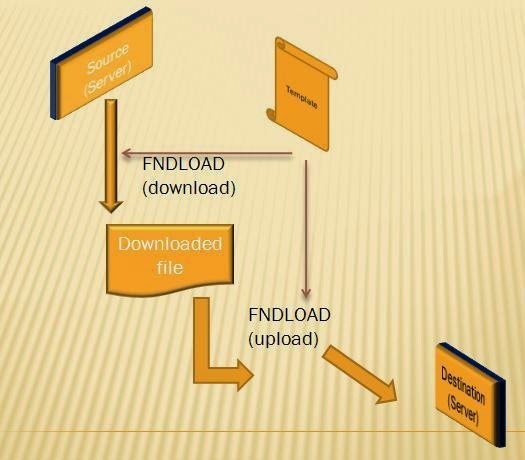 In the Target Environment, make sure that you have done FNDLOAD for new responsibilities prior to running FNDLOAD on users. FNDLOAD <username>/<password> 0 Y DOWNLOAD $FND_TOP/patch/115/import/afsload.lct xxaoa_file_name.ldt MENU MENU_NAME="menu_name"
Oracle Apps Guy: FNDLOAD Download And Upload Commands For Different AOL Components! !